The Alila SCBD Jakarta will open on Wednesday, 6 February 2019. Located next door to the Indonesia Stock Exchange, the five-star hotel features 227 rooms and suites, a variety of F&B outlets and event spaces, an outdoor pool, gym and a spa Alila. From the lunch and dinner crowds to the night owls, Alila SCBD caters to Jakarta’s foodies with New York style ‘Vong Kitchen’ and 24-hour ‘Le Burger’, both by Michelin-starred Jean-Georges Vongerichten and son Cedric, as well as ‘Hakkasan’ specialty restaurants by the Hakkasan Group. 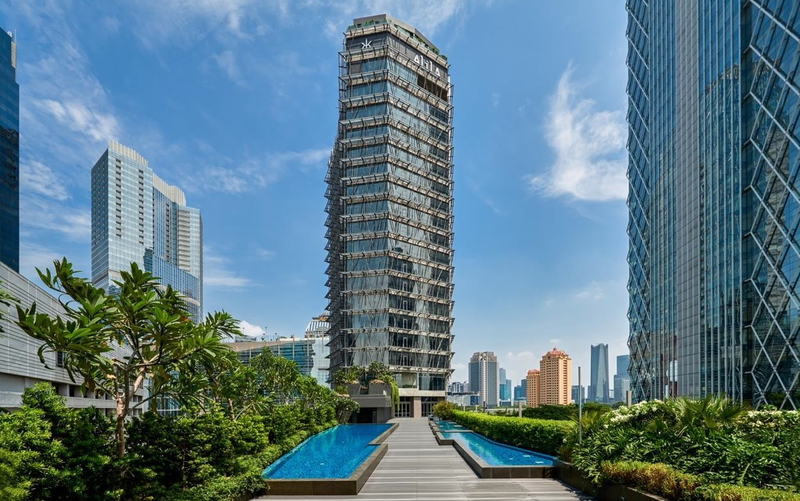 The work of Bangkok-based IAW, the design of the hotel was inspired by the irregular, boot-like shape of the site, resulting in a long podium and a diamond-shaped tower. The hotel’s striking façade features a unique overlapping pattern of aluminium sticks and canopies, creating lines and shadows and a sense of illusion for passers-by. See latest HD Video Interviews, Podcasts and other news regarding: Alila, Indonesia, Jakarta.